SpeedyFox is specially designed to speed up Firefox, Skype, Chrome, Thunderbird and other web programs bogged down by the fragmentation of SQLITE profile databases that naturally occurs over time. The method used in SpeedyFox is 100% safe for your profile (e.g. bookmarks, passwords, etc), it's well documented and has been tested on millions of computers. 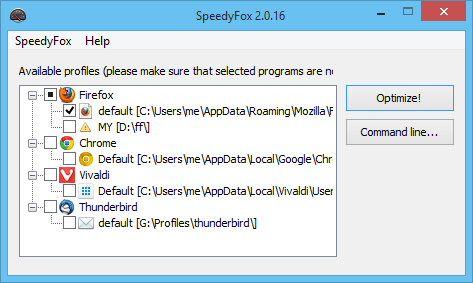 SpeedyFox is portable, supports portable programs and can be run from the GUI or command line. This discussion is only about SpeedyFox (portable) and the SpeedyFox (portable) package. If you have feedback for Chocolatey, please contact the google group. Tell us what you love about the package or SpeedyFox (portable), or tell us what needs improvement. Deployed from e27d7a207f. You are on web.3. UTC time is currently 19 Apr 2019 23:18:43 +00:00.